Guacamole and pico de gallo are two of my favourite dips for snacks. Quick and easy to prepare and super delicious in taste. As a starter, they are great with crunchy veggies and all kinds of crackers. As a meal, dollop them onto tortillas along with grilled veggies and meat for some awesome wraps! When it comes to big gatherings, I learned early on that it is best to have a lot of finger food that is easy to prepare and can be prepared ahead. Another definite is barbecue. Fire on the grill and everyone enjoys participating in the cooking. Grilled meat and veggies, some flat breads, crispy crackers and a bowl each of guacamole and pico de gallo – you are all set for your next barbecue party! For the best guacamole, you need to use ripe avocados. To test, just press them slightly from outside, if they feel soft they are good to use. To open the avocado, cut into half and pull the two halves apart. 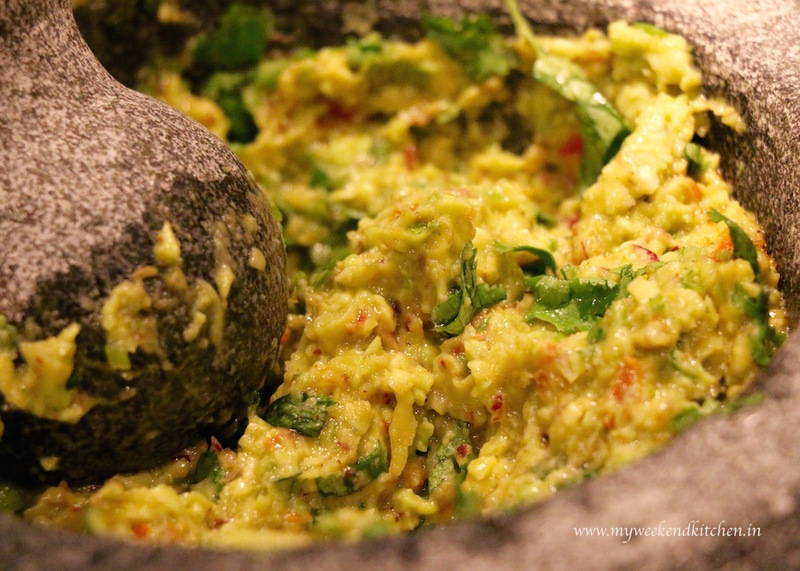 Remove the big stone and scoop out the avocado in a big mortar and pestle or a mixing bowl. Lightly mash the avocado leaving a few chunks of avocado as is. I prefer a chunky guacamole so I don’t mash it to a paste. Add the rest of the ingredients, mix well. Taste and adjust seasoning. You can prepare guacamole 4-5 hours in advance. Just put in the stone of avocado in the prepared guacamole to prevent the avocado from oxidising. Tomatoes and onions are roughly equal in quantity in this recipe. Also try to dice them in small similar size pieces. 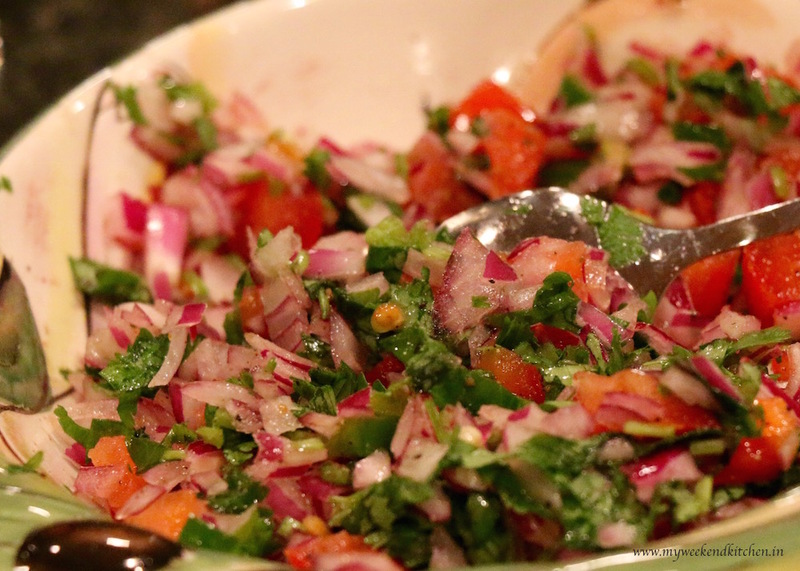 In a mixing bowl, combine together the diced onions, tomatoes, chilli and coriander leaves. Season with salt, pepper and lime juice. Mix well. Taste and adjust the seasoning. Cover and chill for about 30 minutes before serving. We like both guacamole and pico de gallo spicy so I use the whole green chilli with seeds, but if you prefer a milder flavour, remove the seeds of chillies in both the recipes.